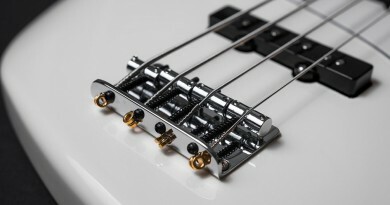 The AstroFlange share the same physical design as the I-90 Bass Chorus and the Californiwah envelope filter. Four knobs and one footswitch. 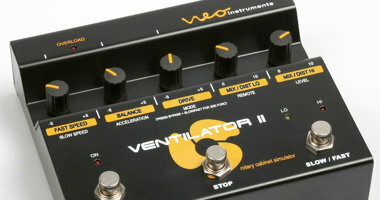 Starting from the left, VELOCITY controls the speed of the modulation effect. The ALTITUDE controls the ‘height’ of the effect, relating to the center frequency. In many cases these controls would be referred to as RATE and DEPTH. The next knob is labelled LOW CUT and it simply allows you to dial in how much of the low end is affected by the modulation. Finally, the EFFECT LEVEL knob is fairly self explanatory, allowing you to adjust the balance between the dry and wet signal. There are 3 different kinds of sound clips for this review. First up are the Fingerstyle clips – DRY version followed by 4 various settings. You can see from the name of each sound clip how the knobs are set. On the first clip with the AstroFlange pedal engaged, all knobs are turned all the way up. It means max amount of modulation and no low cut or dry tone coming through at all. It is about as radical as it gets with this pedal. For better or worse, as I have heard many other flangers that can take much further into space, but having said that, I rarely go there anyway so in reality – and from a practical point of view – I think the range of the effect is rather well chosen. On the following sound clips, you can hear that the Low Cut is quite effective to bring back some of the definition that may get lost in a heavily modulated effect. Similarly, blending in some of the dry tone also helps a lot in that department. Much like with the fingerstyle examples, I prefer a bit of Low Cut, but generally this pedal is actually useful throughout the entire spectrum. Finally, let’s check out how the pedal sounds on a few Slap examples. Admittedly, I rarely use modulation on slap, but that should by no means stop you from doing it. 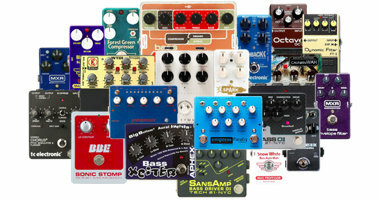 As far as I’m concerned, there are no rules in bass and I do enjoy experimenting with pedals! To me, a flanger pedal can just as easily be remarkable for its ability to be easy to dial in usable tones, as for its ability to go to the extremes. In that respect, the AstroFlange is what I would define as very ‘usable-versatile’. This should not be interpreted as a way to search for something positive to say. 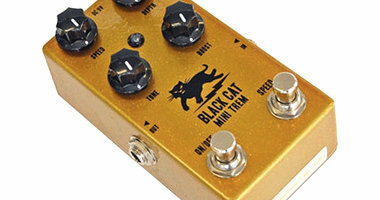 It is a fact that when you are on the stage or in the rehearsal space, it is often crucial to be able to quickly make minor adjustments to your tone. And if the parameter range is too great, even a small notch may take you way off the tone you want – yet with a slight tweak. The quality seems any bit as good as on the other Eden pedals, including the popular WTDI and the funky CaliforniWAH. And it does share the same physical design as the other dedicated bass pedals from Eden, which of course opens some of the same topics when it comes to the design choices. So, more or less repeating myself, yes it may seem odd that the power supply must be 15V with positive center, which makes most ‘regular’ external power supplies insufficient. But as I have also stated in the other Eden reviews, while this is a practical obstacle when setting up your board, once it has been dealt with you don’t have to worry about it again until the day you re-design your pedal board. 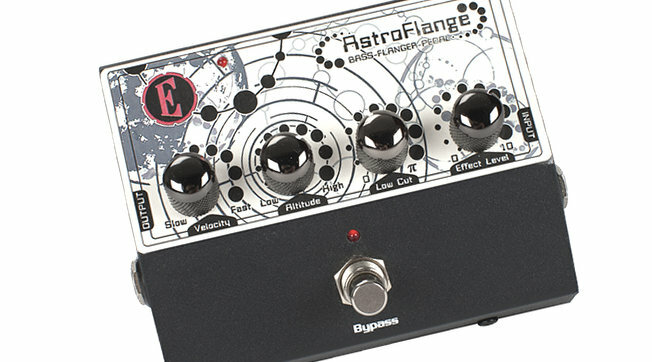 The AstroFlange is planned to retail at around $150, which makes it fairly affordable. 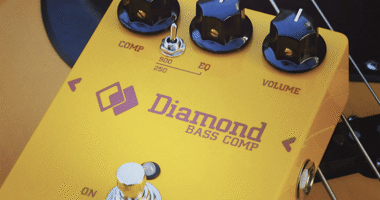 Not that you can’t find a cheaper flanger pedal out there, but this one is made for bass and has a fine balance between between price and features. Decent value for money – not a complete steal, but also not a robbery! If there is one thing to be stressed it would probably be that this is a sensible pedal that do not go to the extremes, which is actually a good thing. Most of the effect parameter range is usable and the modulation knobs can easily go all the way up and still create some great tones. To maintain definition, the Low Cut and Effect Level knobs are lifesavers and their function can’t really be underestimated even though is may sound like ‘boring’ features.